There are multiple facets to the Shane Theme, as I have described in detail in my blog entry for Cherokee Rose. In Triggerfinger, I found that Shane is unraveling to the point that the melodic, acoustic guitar-based section of his theme really didn’t fit anymore. So, I went back and brought in the haunting hurdy gurdy melody that will continue to reflect his fractured view of the world in coming episodes. Triggerfinger featured some fantastic action cues. I had a lot of fun with the scene where zombies are closing in on Herschel, Glenn and Rick while their prisoner is stuck on the iron fence. But, my favorite action cue was the sequence where Lori is trapped in the car while the walker presses through the broken windshield to get at her. The visuals were truly horrifying and instantly inspiring. 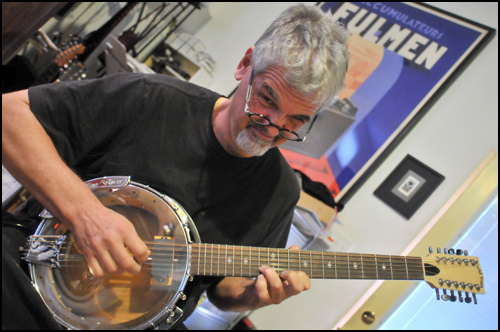 The electric banjo has always functioned as the definitive instrumental color associated with zombies and their impending danger. This idea will continue to evolve in the coming episodes. However, Triggerfinger was tricky because it introduced new non-zombie threats that needed musical attention. Perhaps there’s some irony in my choice of instruments here. I used cold synthesizer textures to represent the danger presented from (living) humans and vibrant instruments played by live players for the danger from the undead zombies. That is almost counter intuitive, isn’t it? This wasn’t done on a conscious level, but strikes me as funny now that I’m looking back on it. I had some fun with the closing scene and end credits for Triggerfinger. At the end of the episode, Lori has a private moment with Rick, telling him what’s happening with Shane. Now he finally begins to understand the problem Shane could present. The camera slowly pushes in on him in a dramatic tracking shot, and I introduce a dark, undulating distorted synthesizer texture (similar to the ones used earlier in the episode). “Tears of the Demon” was the first time we collaborated together as composers. I always felt this piece had a strong “Walking Dead” feeling about it. Distorted plucky electric guitar effects and wailing electric violin soar over a searing electronic foundation, with a layer of orchestral strings. We composed and produced the song together last year just for fun and didn’t plan on using it anywhere. It was just an experiment for me to play around in a “dubstep” playground. Only four episodes remain in Season 2. I can’t wait for you guys to experience the chaos and emotion!